An ornately carved and imposingly tall grandfather clock towers over visitors in the reception area of the Eu Yan Sang corporate head office, located in a 103-year-old shophouse in South Bridge Road. The clock, fittingly, belonged to the grandfather of its current owner. It had chimed the hours in a hallway of what was once one of Singapore's largest private homes, Eu Villa. From 1914, the Edwardian Baroque mansion stood on five stately acres on Mount Sophia, its affairs overseen by its owner, businessman and philanthropist Eu Tong Sen.
His grandson, Richard Eu, 66, has the clock now, and is also the chief executive of the company founded by his great- grandfather (and Eu Tong Sen's father) Eu Kong in 1879. "It's a reminder of our heritage," says Mr Eu of the timepiece, one of the few objects rescued from Eu Villa before it succumbed to the wrecking ball in the 1980s. The past, like the clock, looms large in the company's present, he says, because "it's really only when you know where you come from that you know where to go". The group chief executive officer of the traditional Chinese medicine (TCM) company knows about looking ahead. He joined the business as general manager late in his life in 1989, when he was in his 40s. With three cousins, he began a campaign to wrest control of the company back into family hands when the firm was in danger of dissolution. He helped modernise its products and how it markets and retails them. Since then, the listed company has grown into a brand known across Asia. Two months ago, Mr Eu racked up a different sort of achievement. The amateur musician, known to sing at charity events and play blues harmonica, launched an album of jazz, blues and rock standards. The CD's title is 66, a nod to his age and the Route in the United States celebrated in popular music. Inside the sleeve, the dedication reads: "This album is dedicated to my father and late mother, who didn't disown me when I thought the point of studying in London during the Swinging Sixties was to be like Mick Jagger." In the liner notes, he thanks everyone who "put in so much effort to help me realise my dream". "This is for the bucket list," he writes. While he is not the first prominent non-musician in Singapore to record music, rarely has such a project been tackled with such ambition. Mr Eu is the frontman on every song in this collection. All but two of the nine tracks feature a band of over a dozen session players, recorded in Paris by Singapore-based French producer Bruno Le Flanchec. Mr Le Flanchec, 53, says he worked with Mr Eu to select and arrange the songs. The titles, which include Big Yellow Taxi (made famous by Joni Mitchell) and Beast Of Burden from The Rolling Stones, were adapted to suit Mr Eu's mellow voice. The album was largely put together at local production house Resonance Audio. Studio co-owners Bryant Hwang (a cousin of Mr Eu's) and Leonard Fong also worked on production. All proceeds from the sale of the CD go to the Rainbow Centre, which runs educational programmes for special needs children, and the Dover Park Hospice. Mr Eu was named Ernst & Young Entrepreneur of the Year in 2011. That allowed him to be a member of the Ernst & Young Entrepreneur of the Year Academy, a business networking group comprised of past finalists and prize-winners. Since its launch at an Academy-organised charity event in May, the first pressing of 2,500 copies has been largely sold, and another run of 2,500 copies is expected to be pressed soon. The disc, priced at $20, is stocked at That CD Shop outlets, the Rainbow Centre and Dover Park Hospice, and also online at www.mylifeinc.me/66. The self-funded project has cost him several tens of thousands. But he reckons that compared with conventional philanthropic methods, such as hosting a one-off dinner or auction - events not without their own high costs of production - a CD is a tangible product with a longer money-earning lifespan. Pouring himself into his hobby was not so easy when he was younger. His father, also named Richard, now 90, is an opera enthusiast and frowned on his eldest son's teenage fondness for rock 'n' roll. "He thought it was a bad influence. He banned me from Elvis Presley movies. It all became forbidden fruit," he says, laughing. He spent the early part of his childhood at Eu Villa, under the eye of his parents and amahs. He is the eldest of four children. Brothers David and Geoffrey are, respectively, a doctor and a journalist and sister Helena is a housewife. As a boy, Richard was sneaking listens to pop records while studying at Anglo-Chinese School. After Secondary1, he was sent to the English boarding school of Kent College in Canterbury and, later, he went to the University of London to study law. In London, he was a young man in the right place, at the right time. The British Invasion of the world pop charts was in full flower. He revelled in it, watching as many bands as he could. When he returned to Singapore during summer breaks, he became a roadie for an uncle, Fred Eu, who ran Singstar, a concert promotion company. He travelled in Singapore and Malaysia in 1965 with chart-topping British pop band The Honeycombs. The musicians would fly from town to town, while he, with the crew, took the bus, he says. He came back to Singapore for good in 1971 with a law degree and chose to work outside the family business. There was no family pressure on him to join, and he also did not see a role he could play. So, among other jobs, he was a stockbroker, merchant banker and venture capitalist. Then, in 1989, he felt the time was right and joined Eu Yan Sang as general manager. To keep the company alive, he had to drastically alter its personality. He had worked as corporate planner and company secretary at luxury products company Transmarco, which used to carry brands such as Piaget and Cartier. "I saw how retailing was modernised, the whole of luxury retailing was new, and it was something I could apply," he says. Since the death of Eu Tong Sen in 1941 and the fragmentation of ownership of the medical business among heirs in Singapore, Malaysia and Hong Kong, the methods of doing business had remained stagnant. There was a stubborn focus on distribution, not retail. Mr Eu saw that reaching the end-user was crucial. Herbal products had to be sold in attractive, easy-to-use packages. "We had to reach out to customers, and not expect them to come to one shop in Chinatown. And it was the same in Malaysia," he says. But there was internal opposition. His uncles were worried that new shops would steal customers from one another. Mr Eu, however, was planning to grow the customer base. TCM then, as now, had been gaining popularity among those seeking alternatives to Western pharmaceuticals. "It was a gut feeling. If you have a musty old medical hall, it doesn't make people want to walk in," he says. Then came a shock. He had barely warmed his seat as general manager when property and construction firm Lum Chang took control of the company, having bought shares from members of the sprawling clan, several of whom did not agree with Mr Eu's vision. Mr Eu banded with three like-minded cousins and, in 1993, bought out Lum Chang's stake in the Chinese medicine business, as by then Lum Chang saw little future in the healing trade. Just when it seemed as if there was to be smooth sailing ahead, there followed a messy legal struggle over the use of the Eu Yan Sang name, between descendants in Hong Kong and those in Singapore and Malaysia. That, too was resolved and, in 1996, the Hong Kong business entered the Eu Yan Sang International fold. Growth could begin in earnest. Mr Eu says that the Lum Chang takeover was a blessing because it consolidated ownership in one place, allowing it to be passed on to his family group. He has said in past interviews that in a family with 72 cousins - Eu Tong Sen had 13 sons and 11 daughters - not everyone would see eye-to-eye. And with a family of this size, it was never a given that he, out of so many heirs, would get automatic entry into the executive suite. He does allow that emotional bonds spurred him to keep Eu family involvement in Eu Yan Sang through the turbulent 1990s. The medical business had always been an adjunct, and a relatively minor one, to his ancestors' core business of tin mining, banking and property. But those activities had vanished into history. 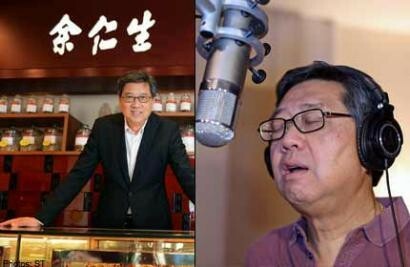 "My father said that Eu Yan Sang is the last business that carries the family name and that we should try to keep it," he says. The overhaul of the company since his entry in 1989 has resulted in an $8-million-a-year company seeing a turnover of $290 million in the 2012 financial year, with profits of $20.8 million. The group now has more than 300 retail outlets in Australia, China, Hong Kong, Macau, Malaysia and Singapore, and its products are carried in stores beyond its own retail outlets. It runs a chain of 27 TCM clinics in Singapore and Malaysia, and two Integrative Medical Centres in Hong Kong that combine TCM with modern clinical practices. Retired psychiatrist Ong Yong Lock, 65, has known Mr Eu since primary school. Dr Ong, in an e-mail interview, says he is impressed by Mr Eu's "fine and strong business sense" as well as, when he was younger, his "large and eclectic record collection". Mr Eu and wife Mary married in 1981 after a whirlwind six-month courtship. "We had chemistry. We clicked," he puts it simply. They had friends in common and had their first meeting in a Hong Kong disco. Mary Eu (nee Chow), 58, who grew up in Shanghai and Germany and attended school in the United States, says: "He was 33 and I was a bit younger and we both knew what we wanted. It just felt right." They have four children. The eldest, Richie, 28, is preparing to join Eu Yan Sang, having left a private equity firm. Anthony, 25, works in New York as a television production executive. Christopher, 23, is a business student at Boston University. He also plays guitar on 66. Rebecca, 19, is an undergraduate in Melbourne. Mrs Eu says her husband has always been inspired by rock music. The album is a natural step forward for the hobbyist musician, she thinks. "He never worries about what people think... he's confident. He enjoys himself. When the kids were young, they were embarrassed when he got up on stage at charity events to sing. They would go hide," she says with a laugh. "Making an album" might now be crossed off Mr Eu's bucket list, but there are goals left to be achieved in business. One milestone yet to be reached: Making Eu Yan Sang a billion-dollar company, he says. He has, however, hit one specific target. He has managed to help keep the business in family hands. "There is some pride involved, that we are continuing the business through the fourth generation. To not let it go down the drain."